Since the weather continues to be abnormally Spring-like, I would invite you back into my garden. The flowers have taken hold in every corner and I would walk you around the property to show you. We will need to avoid the ants, which become a nuisance this week when I stepped into a nest. Since I only bought this house in the fall, I never know what will pop out of the naked branches. Each day something new shoots up. I’ll finish the tour with the Quince, a huge bunch of dead looking sticks now exploding with petals. As we sip coffee and snack on sweet, chocolaty goodies, I’ll tell you how I’ve been writing outside or in front of a window pretty much everyday. I’m going back and forth between working on a ghost story novel I started over the summer and trying to finish the heist novel. The first one is going great, and the second one just went through Beta readers, so it has tons of things to fix. I’ll tell you it wasn’t all good this week. My homeschooling chemistry lab on Friday was a flop, and we failed (despite repeated attempts) to generate measurable gas levels from a galvanized nail in a muriatic acid solution. You listen kindly, but since you don’t home school your kids I’m not sure you get it. We both agree homeschooling is not easy for the mom, or the kids. To change the subject we talk about books. I tell you I started reading my fifth novel of the year yesterday. That puts me well ahead of my 24-book Read Harder goal. So far only one novel disappointed me. That book earned one and a half stars. Oddly enough, it was the book I was most interested in reading. You remind me that sometimes you can’t judge a book by its blurb. I mention the one down side to my new reading program: I’m attempting to use GoodReads. I’m forced to admit I have no clue what I’m doing. You remember my first failed attempts at blogging, Twitter, and Facebook, so you reassure me it will get better. You ask about the blog. Of course you saw the new blog badges on the sidebar. 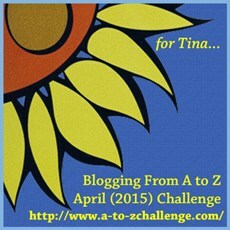 I confirm the good news about the Very Inspiring Blogger Award, and that we signed up for the Blogging A to Z Challenge. This is our second year, and this time we have a theme picked out. You ask about the theme, but I just smile and remind you it’s a secret. On the plus side, I tell you what a great blog month it was. It was the best comments month we have ever had! Really, just fantastic. Our old friends welcomed us back after the long winter vacation and new friends showed up on our front page and said hello. On that note, I’d tell you we were looking for some new guest bloggers. We already have two lined up, but I’d ask you to pass along the information to anyone with a writing-related topic they might want to share. At that moment my kids burst out the patio door and make a bee line for the trampoline. Amid the shouting you decide it’s time to head home. But you promise me you will be back. 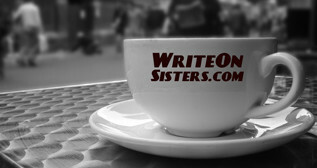 If We Were Having Coffee is a blog hop inspired and run by the lovely and talented Diana, over at Part Time Monster. Please drop by her place for coffee. You can also see what other bloggers are hosting a coffee party by checking out the hashtag: #WeekendCoffeeShare on Twitter. I’d love to have a hot chocolate with you (never learned to drink coffee) and discuss that garden. Just got my first seed catalog today and can’t wait to “read” it. My garden, like most of the commentators, is under a layer of snow and it’s hard to get to the compost to add to it, but the official first day of spring is only 45 days away. AND I can set my seeds now to give them a head start–the ones I transplant anyway. I got a new gardening book for Christmas, too, so I can read and plan even when the snow falls and the wind blows. Hot chocolate sound perfect, I’ll join you. I’m less into seeds at this point and more into plants. I think I want to add some more trees to the yard, perhaps an apricot, or an apple. I love to garden! The yard is my happy place. I wish you luck with yours, your planning to get a jump on spring sounds ideal. I am a public school teacher and have taught just about anything you can imagine at church. It doesn’t matter where you are teaching, lessons will fail at some time. Doesn’t matter how much research, planning, preparation, or even how fool-proof they are, every plan will fail at some time. And it’s uber annoying and frustrating whether I’m working with a small group or a large one. The size of the group doesn’t change the impact on my emotions or sell-esteem. But, we get up and do it again, and know that it isn’t us, it’s the way of life! The best lessons happen in the failures not in the successes. I actually encourage students to fail. Be willing to be wrong. That is where we learn the most! I linked to your post in my post. I hope that was ok. I found an ah-ha in your post today that I needed to not beat myself up over a missed goal. Thank you for that!!!! I’m glad you liked the post. Linking is just fine, people do it all the time and we consider it an honor. Thanks for stopping by and for the kind words about teaching. We all have those days when things don’t go right, but it’s helpful to remember it’s not just us it happens too. I live in the mountains, so I should have snow at this time of the year. If not at my house, than at least near by. But it has been warm all winter. Oh, I wish we had room for a garden! I’ve lived in the country for most of my life, with plenty of grass and trees and room to grow things. We don’t have a proper yard right now–just a bricked over patio in the back and a little playground across the street. I miss greenery. I also home school (currently 8th grade), and we also have the occasional “failed” experiment. I do get frustrated when things don’t work out as planned, but I try to look at it as teaching the more aggravating parts of science. 🙂 And I totally agree with you that home school can be tough on mom (or, in my case, stepmom)…so much planning and work and research and, sometimes, disappointment. The really awesome parts of home school make things totally worth it though. 😀 I enjoyed having coffee with you! I’m really happy to have another homeschooling mom and stepmom, chime in. There are some challenging days, and science and math are the hardest for me to cope with. We did it this year because of moving to a new town. My eldest was really concerned about changing school mid year. Thanks for the encouragement. I’m sure it will get better and it is nice spending time with my eldest. I don’t have that many years left that he will be interested in hanging out with his mom. The chocolate is appreciated as well as the garden tour. Do you make anything with the quince fruit? I like the idea of writing outside for a change of pace. I have been thinking of trying new places and spaces for writing. You have reminded me to try it. I just bought this house a few months ago. I don’t even know what kind of quince I have yet. If I have one of the good types, and I get enough fruit, I will make jam from them. I love to mix up my work space, mostly because I work off the kitchen in a little mud room space. I’m in the process of renovating a cottage that’s in the way back of my yard. It’s not a huge space, but I’m really looking forward to having my own office. Thanks for stopping by. Thanks so much for the tour, it was lovely, and the chocolate treats…yum! Home-schooling can be terribly hard, and I know this from experience. I home-schooled my daughter for a year, and it was a stressful time for us both, but we got through it and it helped her through a difficult time. You already know I’m doing the Read Harder challenge and I’ve started my first book, so I’m way behind you! I have chosen the complete list though, so I’m excited to get stuck in. As for the A to Z, I’m excited about it myself. On my other site (Writing Room 101) I’m planning a practice run in March, and all of the posts will be writing related (tips and tricks), so I’d be happy to guest post one of these. Thanks again for the coffee. I hope you have a lovely weekend…watch out for those ants! I think that’s the nature of being a mom. You always think you can do better. Thanks for the pep talk! I needed that.